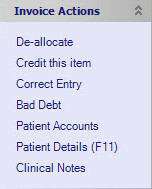 When a patient has failed to pay a fee, you can mark it as a “bad debt”. A note will be added to the patient’s alerts, which will appear when you make an appointment, open their notes and open their details. Enter a patient’s account. Select the Account Payment tab. Find the invoice that you want to write off. Tick “Show All” if it is not visible. View individual items (fees) in the invoice by clicking on the + to the left of the invoice. 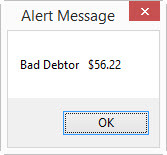 Select the appropriate items (fees) and click on Bad Debt in the right-hand actions list. You can adjust the amount of the debt when prompted.